It is widely assumed that about 10% of annual plastic production ends up in the oceans. That would mean that about 30 million tonnes end up in our seas every year. But this is just a myth and has been spread by a UN mistake as reported by Nordic Science. The actual number is 2 – 4%. The UN knows it is a mistake but it serves their “political” goals to go slow with any correction. I would go so far as to say that the UN mistake (by a consultant – of course) was quite deliberate. Which advocacy group did that consultant come from – I wonder? It is tempting to beat our largest drums when fighting pollution. … One of science’s cardinal virtues is accuracy. Despite that, scientists are contributing to the dissemination of numbers with rather nebulous sources. When ScienceNordic’s Norwegian partner forskning.no recently wrote about new calculations quantifying the plastic debris in the sea, we wondered why the new figures were so much lower than previous findings. A number of researchers stated that the new calculation methods were the best they had seen to date. So we tried to find out how other scientists had ended up with a much higher figure –ten percent of the world’s plastic output. This was no easy task. The one-tenth figure cropped up ubiquitously, but no one could say what research it was based on. Apparently it didn’t come from research at all. Some still claim that ten percent of the plastic produced annually ends up in marine environments. In 2013 alone that would equate to 30 million tonnes. This is a staggering amount of plastic for the oceans of the world and the marine life in these seas to cope with. The latest calculations decrease this share of plastic debris to two to four percent of annual output. We started searching for the source of the ten-percent figure. Each reference pointed to another, which in turn referred to another article or paper in an apparent endless chain. Where was the original source? A UN document for a workshop of international experts on marine debris also referred to a scientific paper. But when we checked that paper there we found no trace of this ten percent estimate. The UN document was a draft. The mistake had already been pointed out by a scientist at the workshop and checked out. Jihyun Lee explains that the number will now be deleted from the final report. But the number had already spread internationally, including to Norway, where the expert on plastics Geir Wing Gabrielsen of the Norwegian Polar Institute quoted it in the media. “When I read a scientific article or a UN report, I expect the references made to be correct and they should be possible to confirm. It is unfortunate when, as in this case, numbers are impossible to track down,” he writes in an e-mail. Forskning.no finally traced the 10% number through many a false citation to a non-peer-reviewed conference presentation by a Professor Richard Thompson of Plymouth University who now admits he had no basis for the number but says it was based on “grey” literature. Which advocacy group did his “respected source” come from? “ It was from a respected source, it seemed credible and I believed it as did others,” he writes in an e-mail to forskning.no. But he doesn’t answer the question of why he neglected to investigate the reference which the number comes from. Thompson writes that he relied on grey literature, in other words, information from the authorities, organisations or academics who have not been peer reviewed through formal scientific publications. Typically, this could be a report, a work note or a presentation. “On further digging there is no substance to them – they were guesses and I should not have used them. I have not used the quote again,” he writes. No doubt the consultant and the grey literature were from some advocacy group, such as Greenpeace, who have no qualms about making up information when it suits their purpose. Lies are justified as necessary because their “ends are good”. I note that the UN bureaucracy believe that the end justifies the means and their means include disseminating “grey information” as if it was gospel. It is not so surprising then that the UN IPCC reports on climate are full of highly dubious grey literature. The UN’s scientific panels are little better than advocacy groups. Accuracy and truth have just become collateral damage in the furthering of their political goals. And the IPCC leads all the rest. “Global” temperature is necessarily a construct. It is “calculated” by taking raw temperature data as measured at particular locations, massaging this data according to algorithms devised by those calculating the “global temperature, applied to areas where there are no measurements by some other algorithms (oceans, poles, forests and deserts), adjusting past data and then coming up with a “global” temperature. Studies have already shown that, in the US, Australia, New Zealand, the Arctic and South America, in far too many cases, temperatures have been adjusted to show a stronger and clearer warming trend than is justified by the raw data. An investigation now to be carried out by an international team is to establish a full and accurate picture of just how much of the published record has been adjusted in a way which gives the impression that temperatures have been rising faster and further than was indicated by the raw measured data. …. something very odd has been going on with those official surface temperature records, all of which ultimately rely on data compiled by NOAA’s GHCN. Careful analysts have come up with hundreds of examples of how the original data recorded by 3,000-odd weather stations has been “adjusted”, to exaggerate the degree to which the Earth has actually been warming. Figures from earlier decades have repeatedly been adjusted downwards and more recent data adjusted upwards, to show the Earth having warmed much more dramatically than the original data justified. So strong is the evidence that all this calls for proper investigation ……… The Global Warming Policy Foundation (GWPF) has enlisted an international team of five distinguished scientists to carry out a full inquiry into just how far these manipulations of the data may have distorted our picture of what is really happening to global temperatures. The panel is chaired by Terence Kealey, until recently vice-chancellor of the University of Buckingham. His team, all respected experts in their field with many peer-reviewed papers to their name, includes Dr Peter Chylek, a physicist from the National Los Alamos Laboratory; Richard McNider, an emeritus professor who founded the Atmospheric Sciences Programme at the University of Alabama; Professor Roman Mureika from Canada, an expert in identifying errors in statistical methodology; Professor Roger Pielke Sr, a noted climatologist from the University of Colorado, and Professor William van Wijngaarden, a physicist whose many papers on climatology have included studies in the use of “homogenisation” in data records. Their inquiry’s central aim will be to establish a comprehensive view of just how far the original data has been “adjusted” by the three main surface records: those published by the Goddard Institute for Space Studies (Giss), the US National Climate Data Center and Hadcrut, that compiled by the East Anglia Climatic Research Unit (Cru), in conjunction with the UK Met Office’s Hadley Centre for Climate Prediction. All of them are run by committed believers in man-made global warming. Since “global” temperature – by definition – is a calculated construct it is inevitable that data must be “applied” in some way to make this calculation. But no matter what the calculation method, rewriting history is suspect. When the data of the past keeps being adjusted, and adjusted again, and always systematically downwards, and when all the adjustments invariably cool the past more than the present, then the apparent trend in global temperature has little to do with any definition of global temperature and is merely a trend of the adjustments. In time, incorrect results get corrected. In time, bad science cannot prevail – or so the belief is. But if all the articles about fraud in funding applications, dodgy peer review, predatory journals, confirmation bias and plain fraud in science are only half true, then most of what is reported as current science is not worth the paper it (isn’t) written on. Results reported are not concerned about being correct but about getting the next tranche of funding. “Politically” correct beliefs are not challenged by younger researchers because research funding will be jeopardised if “authority” is challenged. “Peer reviews” become “pal reviews” and even “self reviews”. Journals manipulate impact factors by “pal citations”. It should all get corrected in time, except that publication of corroborating results is discouraged as not being original while “negative results” are not considered worthy of publication. A generally accepted but incorrect hypothesis then never gets corrected until an opposing theory is “proven” with positive results. “In their quest for telling a compelling story, scientists too often sculpt data to fit their preferred theory of the world”. 1. The Lancet: What is medicine’s 5 sigma? The case against science is straightforward: much of the scientific literature, perhaps half, may simply be untrue. Afflicted by studies with small sample sizes, tiny effects, invalid exploratory analyses, and flagrant conflicts of interest, together with an obsession for pursuing fashionable trends of dubious importance, science has taken a turn towards darkness. As one participant put it, “poor methods get results”. The Academy of Medical Sciences, Medical Research Council, and Biotechnology and Biological Sciences Research Council have now put their reputational weight behind an investigation into these questionable research practices. The apparent endemicity of bad research behaviour is alarming. In their quest for telling a compelling story, scientists too often sculpt data to fit their preferred theory of the world. Or they retrofit hypotheses to fit their data. Journal editors deserve their fair share of criticism too. We aid and abet the worst behaviours. Our acquiescence to the impact factor fuels an unhealthy competition to win a place in a select few journals. Our love of “significance” pollutes the literature with many a statistical fairy-tale. We reject important confirmations. Journals are not the only miscreants. Universities are in a perpetual struggle for money and talent, endpoints that foster reductive metrics, such as high-impact publication. National assessment procedures, such as the Research Excellence Framework, incentivise bad practices. And individual scientists, including their most senior leaders, do little to alter a research culture that occasionally veers close to misconduct. “Science has become really opaque, especially when it comes to grant funding”, says UNSW climate researcher Ben McNeil. As a result innovation suffers, he says. The offences in question range from junior scientists ghost-writing grant applications for senior colleagues to researchers conspiring with others to influence who might review their work. In one extreme case a cancer scientist discovered his unfunded project idea had been stolen and used by another research group a year later. The two major schemes that fund research in Australia – the National Health and Medical Research Council (NHMRC) and the Australian Research Council (ARC) – hand out about 1.5 billion dollars a year. The impact of these grants is almost impossible to quantify, but some have resulted in big medical discoveries such as the cervical cancer vaccine and new cancer treatments. They also generate new knowledge, jobs and industries. While the NHMRC and the ARC say they have no evidence that “gaming” is widespread, a recent survey of 200 health and medical researchers suggests this may not be the case. Before handing out money, both bodies ask panels of anonymous experts to assess project ideas, as well as the calibre of the people who propose the idea. When public health researcher Adrian Barnett and two colleagues surveyed researchers about whether they form alliances with others to boost their chances of a better review, they were shocked to see one in five admitted to the practice. “I knew it was going on, but I didn’t think it’d be as high,” says Barnett, from the Queensland University of Technology. A new paper in the British Medical Journal seems to add substance to the view that many academics and their universities put far too much emphasis on self-promotion by means of exaggeration, sensationalism and alarmism. Science by press release seems to be the new paradigm. Rather than journalists it is the supposedly objective academics themselves who “talk up” their own work. Results 40% (95% confidence interval 33% to 46%) of the press releases contained exaggerated advice, 33% (26% to 40%) contained exaggerated causal claims, and 36% (28% to 46%) contained exaggerated inference to humans from animal research. When press releases contained such exaggeration, 58% (95% confidence interval 48% to 68%), 81% (70% to 93%), and 86% (77% to 95%) of news stories, respectively, contained similar exaggeration, compared with exaggeration rates of 17% (10% to 24%), 18% (9% to 27%), and 10% (0% to 19%) in news when the press releases were not exaggerated. Odds ratios for each category of analysis were 6.5 (95% confidence interval 3.5 to 12), 20 (7.6 to 51), and 56 (15 to 211). At the same time, there was little evidence that exaggeration in press releases increased the uptake of news. Conclusions Exaggeration in news is strongly associated with exaggeration in press releases. Improving the accuracy of academic press releases could represent a key opportunity for reducing misleading health related news. Bern Goldacre has an editorial in the same issue of the BMJ. He argues that academics must be made accountable for exaggerations about their own work. I would go much farther than Goldacre. Merely being accountable is not enough – it is liability that is required. I have long had a “thing” about this lack of liability for scientific misconduct “Why cannot a concept of tort or “product liability”apply to scientists?“. For anyone with medical training, mainstream media coverage of science can be an uncomfortable read. It is common to find correlational findings misrepresented as denoting causation, for example, or findings in animal studies confidently exaggerated to make claims about treatment for humans. But who is responsible for these misrepresentations? In the linked paper (doi:10.1136/bmj.g7015) Sumner and colleagues found that much of the exaggeration in mainstream media coverage of health research—statements that went beyond findings in the academic paper—was already present in the press release sent out to journalists by the academic institution itself. Sumner and colleagues identified all 462 press releases on health research from 20 leading UK universities over one year. They traced 668 associated news stories and the original academic papers that reported the scientific findings. Finally, they assessed the press releases and the news articles for exaggeration, defined as claims going beyond those in the peer reviewed paper. ……. Over a third of press releases contained exaggerated advice, causal claims, or inference to humans. When press releases contained exaggeration, 58% to 86% of derived news stories contained similar exaggeration, compared with exaggeration rates of 10% to 18% in news articles when the press releases were not exaggerated. Academics and their institutions are surrounded and protected by a shield of supposed objectivity and good faith. But in the unprincipled hunt for funding between institutions and for academic advancement among researchers, there is a significant amount of falsified and manufactured research results. And then the shield protects them from having any liability. Accountability – if found out – leads to relatively mild consequences. If liability for the scientific “product” is introduced, then the taking of responsibility and accountability will automatically follow. It really needs little comment, except perhaps that the magnitude of “homogenisation” or “adjustments”, or “corrections” as applied to the temperature record makes up most of the “global warming” that is claimed. Homogenisation in Australia, Adjustments in the US. Fancy algorithms to “correct” data, with not a little confirmation bias, could be better described as “fudging”. EARLIER this year Tim Flannery said “the pause” in global warming was a myth, leading medical scientists called for stronger action on climate change, and the Australian Bureau of Meteorology declared 2013 the hottest year on record. All of this was reported without any discussion of the actual temperature data. It has been assumed that there is basically one temperature series and that it’s genuine.But I’m hoping that after today, with both a feature (page 20) and a news piece (page 9) in The Weekend Australia things have changed forever. 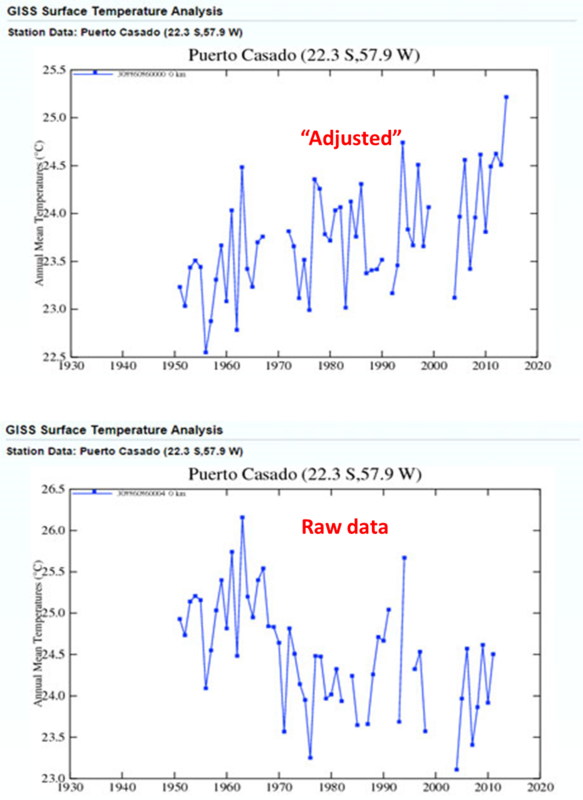 I’m hoping that next time Professor Flannery is interviewed he will be asked by journalists which data series he is relying on: the actual recorded temperatures or the homogenized remodeled series. Because as many skeptics have known for a long time, and as Graham Lloyd reports today for News Ltd, for any one site across this wide-brown land Australia, while the raw data may show a pause, or even cooling, the truncated and homogenized data often shows dramatic warming. When I first sent Graham Lloyd some examples of the remodeling of the temperature series I think he may have been somewhat skeptical. 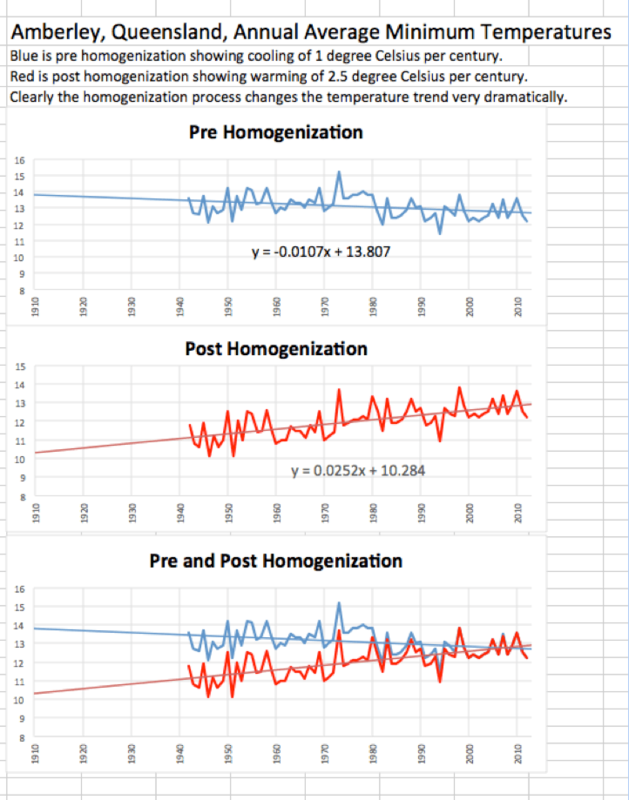 I know he on-forwarded this information to the Bureau for comment, including three charts showing the homogenization of the minimum temperature series for Amberley. Mr Lloyd is the Environment Editor for The Australian newspaper and he may have been concerned I got the numbers wrong. He sought comment and clarification from the Bureau, not just for Amberley but also for my numbers pertaining to Rutherglen and Bourke. I understand that by way of response to Mr Lloyd, the Bureau has not disputed these calculations. This is significant. The Bureau now admits that it changes the temperature series and quite dramatically through the process of homogenisation. I repeat the Bureau has not disputed the figures. The Bureau admits that the data is remodelled. What the Bureau has done, however, is try and justify the changes. In particular, for Amberley the Bureau is claiming to Mr Lloyd that there is very little available documentation for Amberley before 1990 and that information before this time may be “classified”: as in top secret. That’s right, there is apparently a reason for jumping-up the minimum temperatures for Amberley but it just can’t provide Mr Lloyd with the supporting meta-data at this point in time. The two articles in The Australian are behind a pay wall here and here. If you don’t already have a subscription to The Australian take one out today, because the articles are important and Graham Lloyd’s work is worth paying for. Mathematical and computer models are wonderful tools. Once they can be validated they are powerful methods of interpolation. They are useful methods of improving the understanding embodied in the models by extrapolation. The divergence between extrapolated model results and real data can then be used for improving the models to better account for real data. If model results do not fit real data it is time to change the model. Extrapolated model results are never evidence. They are just indicators of what may come to pass provided that the model – in spite of all its simplifications – does truly apply. And when climate model results are fudged to move towards climate data which, in turn, has to be fudged to move towards the model results, one wonders whether there is any scientific method left in “climate science”. This is reported by WUWT from a recent paper from ETH Zurich. then the model and actual observations are very similar. Shameless is one adjective that comes to mind. The Rajasthan University website is suddenly “not available” – whatever that may imply. Update 2: The University website is up again and now updated. Presumably they went down to make the update. The University of Rajasthan has a reputation of being very feudal (even if it is ranked 41 in a list of 511 Indian Universities). On anecdotal evidence they allow quite vicious ragging of first-year students and harassment of female students is quite common. Clearly all is not well at the University and specifically in the Department of Physics. Not just the academic misconduct evident from the manipulation and fabrication of data leading to multiple retractions, but also nasty charges of sexual misconduct and blackmail against the same professors. Prof. Singhal had to retract a 2010 paper and then he had to retract a correction to that retraction in 2013!! Singhal’s colleague, Associate Professor SN Dolia of the same Department of Physics, was a co-author on the 4 Singhal papers retracted so far. They are both present as current faculty on Rajasthan University’s website. They have even had a physics paper retracted because their data was “unphysical”!! 2. Sexual Misconduct: But Singhal and Dolia have other problems to contend with. They are charged with extortion of sexual favours from a PhD student as a condition for being awarded her degree. They are said to have also fabricated obscene photographs to blackmail the student. NDTV News: 30th June 2011. In a huge embarrassment for teachers across the country, a professor at the Rajasthan University has been arrested for allegedly demanding sexual favours from his student. The victim has alleged that her research guide Dr R K Singhal of the Physics department was harassing her for months. The professor asked the girl to have sexual relations with him if she wanted to complete her PhD. Besides molesting her in February, Singhal and his colleague S N Dolia allegedly even blackmailed the student by morphing her face onto some obscene pictures. “While submitting her PhD thesis, the victim was asked for sexual favours by the teacher. Our preliminary investigation has found that the allegations are true and so we have arrested the Professor,” said BL Soni, Commissioner of Police, Jaipur. ….. Shockingly, despite the victim complaining about the teacher’s misconduct, the university authorities took no action initially. It was only after the girl lodged a police complaint that the accused teacher was arrested. Both Singhal and his colleague Dolia were later suspended from the university. Besides suspending the two teachers, the university has also asked two retired Judges of the High Court to probe this shocking issue. The legal mills in India grind on slowly and the case reached court in October 2013. JAIPUR: A court here on Tuesday framed charges against two assistant professors of University of Rajasthan (RU) who were accused of demanding sexual favours from a PhD student preparing thesis under their guidance. The court of chief metropolitan magistrate (CMM) Bharat Bhushan Gupta, on Tuesday, framed charges against Dr Rishi Kumar Singhal and Dr S N Dolia under Sections 354, 341, 292 of the Indian Penal Code (IPC) and Section 4/6 of the Indecent Representation of en (Prohibition) Act. On June 27, 2011 a girl belonging to Bharatpur, registered an FIR against the two professors at the Gandhi Nagar police station. In her complaint, the girl alleged that her research guide, RK Singhal, from the Physics department was harassing her and forcing her to have sexual relations with him. He allegedly used to threaten the girl that if she did not do as she was told, he would not let her complete her PhD. While charges have been framed, the court hearings have not yet – apparently – commenced. But there is no news of any results from the University investigation or of any actions being taken by the University. Interestingly the supposed University investigation reported is about the sexual misconduct charges. Nothing is reported from the University about the academic misconduct. My expectation is that the University will not have the courage to actually do anything or to take any kind of moral or ethical position themselves. They will merely slip-stream behind the legal proceedings to avoid having to do anything. This is tragic and very sad and the “waste of it all” is appalling. Yoshiki Sasai has committed suicide. He was Deputy Director of the Riken Labs and a co-author of the stem cell papers by Haruko Obokata which were later retracted because of her data fabrication. He was himself cleared of all wrong doing but he had gone out on a limb in her support when the accusations began to fly. This is a true tragedy for science and an immense loss to the research community. Yoshiki Sasai was an exceptional scientist and he has left an extraordinary legacy of pioneering work across many fields within stem cell and developmental biology, including organogenesis and neurogenesis. Our thoughts are with his family, friends and colleagues at this time. Sasai’s own integrity was not in question but the Riken investigation criticised him for inadequate supervision. Once Obokata’s data fabrications were established, he must have had a great struggle in determining the correct course of action to follow. I have just a very weak understanding of the shame and responsibility he must have felt as her sensei. But clearly it was sufficient to make him feel that suicide was the honourable course. A mentor of a young scientist whose falsified research findings sparked a scandal that engulfed Japan’s scientific community died in an apparent suicide Aug. 5, Hyogo prefectural police said. Yoshiki Sasai, 52, deputy director of the Riken Center for Developmental Biology (CDB) in Kobe, hanged himself in a facility related to the Institute of Biomedical Research and Innovation, also in Kobe, police said. He was pronounced dead at 11:03 a.m. at a nearby hospital. Sasai was a co-author of articles on a phenomenon called the “stimulus-triggered acquisition of pluripotency” (STAP), which initially appeared in the British scientific journal Nature in January. However, the articles were later retracted due to extensive errors in the research. A Riken investigative committee concluded that Haruko Obokata, 30, the main author of the articles, had fabricated and doctored illustrations in her research papers. The Riken committee also criticized Sasai for inadequately supervising Obokata. Sasai had a brilliant start to his research career. After graduating from the medical faculty of Kyoto University in 1986, he served as a visiting researcher at UCLA and became a Kyoto University professor when he was 36. In 2000, he joined the Riken Center for Developmental Biology and became deputy director in April 2013. His own research centered on the mechanism for creating nerve cells using embryonic stem cells, and he had articles published in such journals as Nature and Cell. He also received numerous awards for medical research. I don’t know who gets the proceeds from this lecture at the Royal Institution (Tickets: Standard £12, Concession £8, Associate £6, Free to Members, Faraday Members and Fellows) but one hopes that Chris Turney – he of the Ship of Fools – does not. “Chris Turney will present the initial findings of the Australasian Antarctic Expedition 2013-2014, and show how private funding brought the public and science together”. Chris Turney made an utter fool of himself in the Antarctic, and yet the Royal Institution is providing him with an opportunity to defend his idiocy on 17th July. Chairing proceedings is the Guardian’s former science correspondent, Alok Jha, who was also part of the expedition. Alok Jha’s reporting for the Guardian was particularly inane. Why the Royal Institution is promoting this charlatan and his commercial interests is beyond me. He helped set up a carbon refining company called Carbonscape which has developed technology to fix carbon from the atmosphere and make a host of green bi-products, helping reduce greenhouse gas levels. It would now seem to be confirmed that US temperature data are being “adjusted” to meet the requirements of the adjusters. This is more than confirmation bias. It is the fabrication of data. I have posted this graph dozens of times, and hopefully this time it will be clear to everyone. The graph shows the average final temperature for all USHCN stations minus the average raw temperature for all USHCN stations. This is a very simple calculation which shows the average adjustment for all USHCN stations. It shouldn’t be a surprise to NOAA or anybody else that an exponential increase in adjustments is occurring, as I have been showing the same graph (crying wolf) for many years. While Real Science has been claiming this fabrication of data for some time it is only recently that it has started receiving serious attention. And it would seem that there are no real temperatures any more across the continental US. Where measuring stations no longer exist, temperatures are just made up for the purpose of “continuity”. Following much recent discussion on USHCN temperature adjustments, I have had a chance to analyse what has been going across the state of Kansas. Altogether there are 30 USHCN stations, currently listed as operational in Kansas, and I have compared the mean temperatures from the USHCN Final dataset for January 2013, with the actual station measurements as listed in the State Climatological Reports. (There is one station at Lawrence, which I have excluded as the file seems to be corrupted). …..
Nearly every station has had the actual temperatures adjusted upwards by about half a degree centigrade. There are 8, out of the 29 stations, which have “Estimated” temperatures on USHCN. This is a ratio of 28%, which seems to tie in with Steve Goddard’s country-wide assessment. Of these eight estimates, five are because of missing data, as listed at the bottom. Four of these are now shut. There seems to be no obvious reason why the other three estimates have been made , at Ellsworth, Liberal and Ottawa. The adjustments at these though don’t appear to be significantly different to the non estimated ones. In addition to recent temperatures being adjusted upwards, we also find that historical ones have been adjusted down. So, for instance we find that the January 1934 mean temperature at Ashland has been adjusted from 3.78C to 3.10C, whilst at Columbus there is a reduction from 4.00C to 3.52C. In total, therefore, there has been a warming trend of about 1C added since 1934. It has always been my understanding that the various adjustments made for TOBS, etc, have been made to the historic data, and that present temperatures were left unaltered. Certainly, the cooling adjustments of about half a degree in the 1930’s would seem to tally with what NOAA have been publishing. But this leaves the question of just why there is a need to continually adjust current temperatures upwards. But that really isn’t true, as some USHCN stations out of the 1218 have been closed and are no longer reporting real data, but instead are reporting estimated data. This is the fabrication of data – institutionalised – to satisfy a pre-determined conclusion.